I wasn’t sure what to expect from this box but I am absolutely in love with it ! Every month I look forward to opening it and I have learned so much from it ! Not only about things I am interested in but myself . It’s filled with amazing tools to use in your practice and day to day life ! I love getting this box every month. It's definitely worth the money, it always comes with so much beautiful stuff. I've been able to fully stock a hutch in a matter of months. I love all the beautiful Crystals they send as well. Not only is the box amazing but their customer service is outstanding as well. Any time I have a problem they are quick to find the solution, even if the fault wasn't theirs. If you're on the fence about it just do it! I promise it's worth it and you won't be disappointed! I can't wait for my next box! This is my favorite box. I love the stuff it comes with. Love!!! Thank you so much. The best I’ve encountered so far!! I get so excited every months when my box arrives. Hands down the best subscription box I’ve ever received. I recommend this box to every beginner Wiccan. (Can we get a referral program because I would probably have 6 months of free boxes 😂). The book of shadows pages are out of this world. 20/10 would recommend! Got my first Witches Moon box today and its definitely a lot of bang for your buck. I love the artwork on the Book Of Shadow pages! So much care and detail went into the products of this box and it shows. 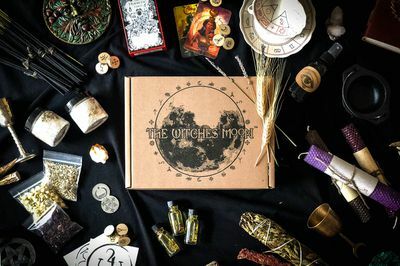 I'll definitely be a long term subscriber to the Witches Moon box and can't wait for the next one! Thank you for such quality and care. I received my first box today. To say I’m delighted is an understatement. The energy of it is palpable! Everything in this box is beautiful, thoughtful and very well curated. The quality of each item is very high and I look forward to using each item. The Beltane salts and Bliss oil smell amazing! I honestly feel that I got tremendous value for the money. I can’t wait to see what comes in the next box! Loved my March box! I really love the art that comes in the box and the hand made candles. I can’t describe how much I love this box! In the time I’ve been receiving it, there have only been two misses as far as my interests go, and even then I found something to love about it! My favorite part is the BOS artwork. I’m not the best at making my own pages beautiful, and this gives me exactly what I need (not to mention each box is a complete ritual without having to buy supplies.) Overall this box delights me. Blessed Be. It is almost as if The Witches Moon knows what items I have been desiring. They certainly outdid themselves with the September box! Two things to note, being a severe asthmatic I freely admit I am not a fan of stick incense, but this month’s selection has an especially off-putting aroma. The scent is overpoweringly soapy and my husband seems to be allergic to it. Also, I feel bad saying this, but I do not like my crystal this month. Maybe I am being picky, but it just does not resonate with me. Perhaps the universe is trying to tell me something and I should reflect on my impression. Otherwise, as the title states, the September box is absolutely amazing!